As with many things, it all began with an iChat message: A few nights ago, Jeff told me to follow Michael S. Williamson, who was newly on Twitter. “He’s back on the road,” Jeff added. As a Washington Post Digital photo-editing intern in 2009, I was familiar with Michael’s work on the “Half a Tank” project. So, following him along for another extended roadtrip was a no-brainer. Shortly thereafter, Michael contacted me and asked if I was going to the Three Mile Island vigil. I said no, and then yes. Later, I asked if we could talk in person about his “Recession Road” project — namely, why was he using exclusively his iPhone’s camera? And so, at 2:30 a.m. on Monday, Michael and I met at Three Mile Island. He brought orange juice, I brought peanut-butter-and-banana sandwiches. He said my car was too clean for me to be a photojournalist, I said I’d had it for less than a week and to give it time. Then we talked for 45 minutes before we had to do our actual work. I recorded the entire interview (with his knowledge and consent). Originally, I was recording just to make sure I didn’t misquote him, but Michael gave such good explanations and quotes that I had no choice but to edit those 45 minutes down into eight different audio clips and blog them. You can read more about the tech-y aspects in a 10,000 Words post I wrote earlier. Here, I’m going to share some of the more photo-centric thoughts and audio clips. © 2011 by Chris Dunn. 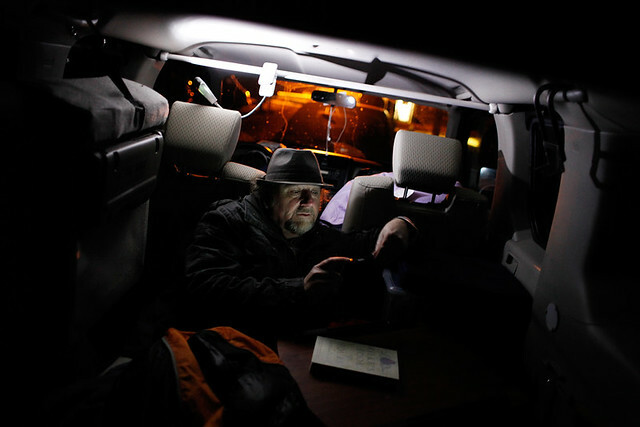 Wearing his trademark hat and with his face illuminated by his iPhone, Washington Post photographer Michael S. Williamson has made a home out of his Honda Element. He showers at truck stops, and occasionally crashes on couches. Not having access to a bed or a private bathroom or any other such luxuries has emboldened Michael. He said he’s lonely, and this loneliness has made him hungry to meet people and get to hear their stories. “It’s just too affected,” Michael said. He uses it on occasion, but he uses the settings that least affect the image, and he’s always sure to point out whether or not he used an iPhone app to enhance or change a photo. But overall, he doesn’t like it. Although Michael plans to retrace some of his steps and revisit many of the places to which he and Theresa traveled two years ago, the stories from 2011 will not be the same as the stories from 2009. “‘Half a Tank’ in 2009 was at the height of the depression,” Michael said. “It was news how many people lost their homes, it was news how many factories had shuttered. That’s not news in 2011. “The point of this project is, it’s a mosaic in that I’m going to do the butcher, the baker, the candlestick-maker,” Williamson said. He’ll cover people down on their luck, people who are doing well despite or because of the recession and people who are just hanging on. At the end of our conversation, I asked what is always my last question: Is there anything else you’d like to tell me or that you think I should know? Be sure to check out the 10,000 Words post for more information about the tech-y aspects of Michael’s project. Finally — thank you, Michael, for sharing your time and offering so much insight about this exciting project. Excellent! I loved the original installment. I’m now following on Twitter for this next one. With iMovie and photoshop-esque applications out there, I bet he could do entire multimedia pieces without a computer.